Jorge Chavez, a driver for Jetco and an American Trucking Associations’ America’s Road Team captain, said that he sees people texting with both hands while driving. He emphasized that people who do this endanger themselves and those they share the road with. Chavez said that driver preparation, such as thorough pre-trip inspections and mapped-out out rest breaks and overnight stays, is key to safe driving. He said recent dispatches have taken him out of town to Arizona and have required extra planning. “Ultimately, everything [comes] back to the driver,” Chavez said. 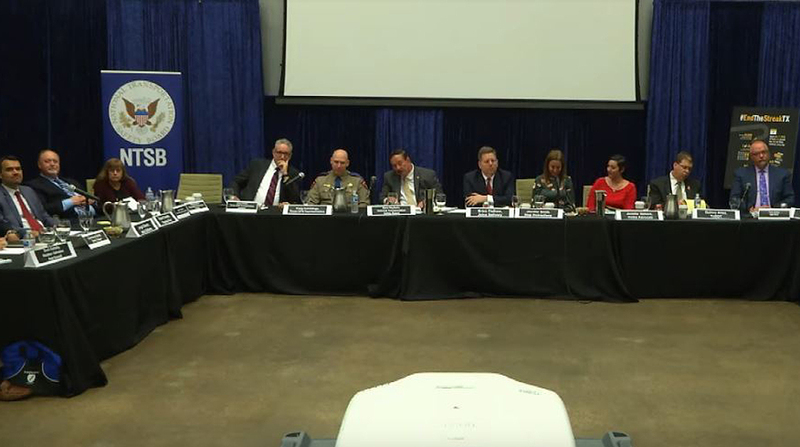 The event, held at the Houston Food Bank and webcast online, marks NTSB’s third roundtable on distracted driving. NTSB reports that nearly 10% of all traffic fatalities are caused by distracted driving, such as glancing at a cellphone or simply not paying attention. The issue is especially prevalent in Texas. In 2017, about 19% of reportable motor vehicle crashes in Texas involved distracted driving. Those crashes killed 444 people and seriously injured nearly 3,000. Texting while driving became illegal in Texas in 2017. More than 90 cities also have instituted hands-free ordinances. Shain Eversley, a senior transportation planner at the Houston-Galveston Area Council, noted that one challenge for truck drivers involves relying on cellphones for information about parking availability when they’re running up against their hours-of-service constraints. The Texas Department of Transportation is in the midst of a truck parking study and recently received federal funding to establish a truck-parking information system along Interstate 10. Quincy Allen, district engineer for TxDOT’s Houston district, said Texas sees about 10 crash-related deaths every day. Distracted driving and driving under the influence account for more than half of those deaths. He said Texas officials haven’t seen a death-free day since 2000. Katie Womack, a senior research scientist at Texas A&M Transportation Institute, said that her program conducts surveys to examine how many people are on their phones while driving. She said that, if a person is on the road in Texas and encounters another driver, odds are 1 in 12 that the other driver is on his or her phone. Anne O’Ryan, a public policy strategist for AAA Texas, said there is a disconnect between how people feel about safety generally and what they think they can get away with personally. For example, she said nearly 88% of drivers say they don’t like seeing other drivers on the phone, yet more than 40% of those drivers use phones when driving themselves. “It’s definitely a perception issue. Even though it can be known to be unacceptable and risky, it still doesn’t apply at the personal level,” Womack said. Eliminating distractions appears on NTSB’s Most Wanted List of Transportation Safety Improvements. The list identifies the biggest safety improvements that can be made across all modes of transportation, including highway, pipeline and hazardous materials, and rail. The agency’s list for 2019-20 was unveiled Feb. 4.